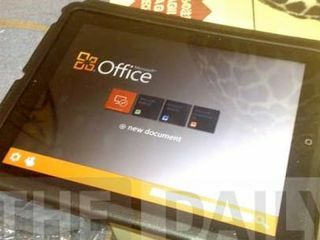 A photograph from The Daily newspaper showing a version of Microsoft Office running on the Apple iPad is a fake, Redmond says. In Tuesday's edition, the iPad-only paper claimed it had gone hands-on with a working prototype, featuring Word, Excel and Powerpoint in one complete application. The report asserted that Microsoft had completed design work on the suite, which would soon be submitted to the App Store for approval. However, the software giant has issued a statement saying the report is inaccurate speculation, while the photograph illustrating The Daily's report is a fake. A spokesperson said: "The Daily story is based on inaccurate rumors and speculation," while a separate rep told Zdnet the photo is not a picture of a real Microsoft software product. Microsoft, which is definitely developing the suite for Windows 8 tablets also refused to be drawn on whether it's even working on a version for the iPad. In a further twist, on Tuesday evening, The Daily's editor told Zdnet's Mary-Jo Foley on Twitter: "We didn't fabricate either image. A working version of the app was demonstrated to us by someone at Microsoft." The plot thickens, but one thing is for sure: Someone's telling porkies.